- Among 1000 European Research groups. - Free WEB-based pdf version to download. We offer you the opportunity to include an advertisement of your company in the Phantoms Foundation related dissemination channels to promote your products in the Nanoscience & Nanotechnology community. Please find below the advertising opportunities to target readers of the E-Nano Newsletter published by the Foundation. A half page (horizontal or vertical) full colour advert in four printed issues of the E-Nano Newsletter. Your Company Logo Banner on the Phantoms Foundation homepage: 600 Euros.. This option includes a quarter web page description of the company (products, contact details, news, press releases, etc.). Adverts must be supplied by advertisers. Submission requirements: electronic image files (jpeg, gif, tif, bmp, png). E-Nano Newsletter advert: Inside pages. Adverts in Black&White15% discount applies.. 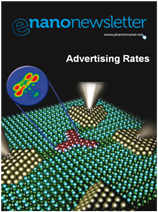 Specified positions (including inside front page, inside back cover and back page of the E-Nano Newsletter), please add 20% to the advertisement rates. For more details on advertising, please contact us by E-mail.